This image is actually of a ring I own, and I chose it to represent what the definition of text means to me because when I think of the word itself, I think of a means of communication. Beyond that though, I believe the manner in which communication occurs can greatly vary, and by no means needs to come through obvious written words as it too can derive from symbols or images. To better explain how exactly this rings shows that, the story behind the ring must be told. I bought this ring a few years ago from a local jeweler and craftsman from his shop in Tel Aviv, Israel. While I was in the store he told me how many of his handmade pieces, like this silver ring, are all uniquely designed and created. What makes his work different from most others though, is that he embeds different stories from his life into his crafts. 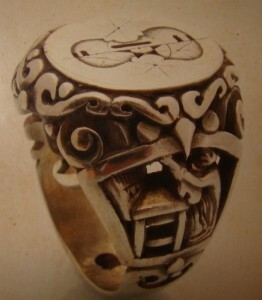 So within this ring, for example, you can see a violin on top and a craftsman working at his desk. The reason he chose both of these images is because years before, the first craft he himself learned to make were from an elderly man well known for his amazing handmade violins in Venice. Thus, through this story I believe it becomes more apparent how stories can be communicated in multiple ways, and even though he could of used written words as the text for this story, I believe expressing it in images on a ring offers more creative value. This entry was posted in Text and tagged communication, craft, creative value, text. Bookmark the permalink. What a gorgeous ring. I love that the ring contains the jeweler’s life story. How beautiful. It is so wonderful that artists can capture a story in an art piece and yet depending where and how you see the ring, the story could unfold in a slightly different way each time but it would always be his story. So great. Thanks for sharing it.